With the 2018 Volkswagen Tiguan, you will get a compact sport utility vehicle that is as fun to drive and dynamic as any Volkswagen vehicle with a refined and elegant interior and exterior. In other words, you get what you would always expect to get from a Volkswagen vehicle. That said, you also get what can only be described as one of the most spacious and versatile SUVs in its segment thanks to a host of improvements made to this all-new generation. The 2018 Volkswagen Tiguan is now in better position than ever to answer the needs of its owners, and there is nothing you won’t love about this German compact sport utility vehicle. One of the complaints many owners had about the previous Tiguan was that it was somewhat lacking in the interior space and versatility departments. That’s no longer the case with the new Tiguan which now sits on an extended wheelbase. Its overall length has increased by 268 mm and overall interior volume has grown by 60 %. Overall, the new Tiguan is now one of the most spacious compact SUVs in its class. It features more than 1,000 liters of total cargo space available behind the rear seats, and more than 2,000 liters if you lower the last row of seats. It is also capable of having a third row to transport up to seven passengers, making it one of the few models in its segment offering that capability. No doubt about it, the new Tiguan has everything you could ever need in terms of versatility. On the other hand, it is still a vehicle that provides a ton of driving pleasure and enjoyment. 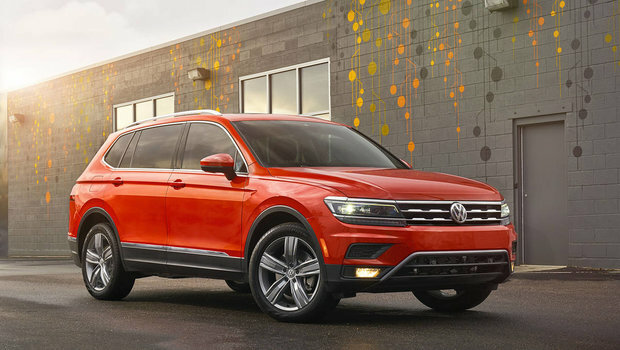 Thanks to its new turbocharged four-cylinder engine that delivers 184 horsepower and 221 pound-feet of torque, the 2018 Tiguan is capable of providing buyers with an SUV that is both powerful and fuel-efficient. The new 2018 Volkswagen Tiguan starts at less than $30,000. 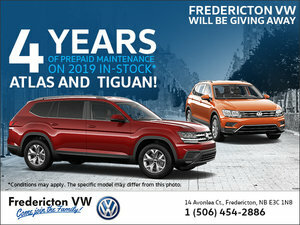 Come check it out today at Fredericton Volkswagen!